SEO in Magento 2 has always been a challenging work for any store owners. In this article, we will show you the complete checklist for Magento 2 SEO from scratch. By using the checklist, you can prevent yourself from making SEO mistakes when doing search engine optimization in your site. One of the most fundamental factors affecting SEO is site speed (as Google has mentioned before). The default Magento 2 does support faster loading time than Magento 1. However, you still can upgrade your site speed even more for both search engine optimization and user experience. What default Magento 2 supports: Enable flat category, merge CSS and JS files, use Content Delivery Network, Cache Management, Image Optimization are common tips you can easily set up at the backend. Most online shoppers use mobile to search for the items they need. Hence, mobile-friendly is a must-have for any ecommerce site. And Google also takes it high in the ranking factors as well. What default Magento 2 supports: The default Magento 2 already supports quite decently for responsive of the mobile version on any devices. The Accelerated Mobile Pages was officially launched by Google in 2016. If you go on the search result now, you can notice the AMP sites (often in the first page) with the little lightning symbol. The AMP is 4 times faster than the regular mobile pages, which is expected to be very important for SEO in the future. What default Magento 2 supports: The default Magento 2 does not support creating the AMP version (which is separated from the regular mobile version). Site architecture — or how the pages on your site are organized and arranged — is an important search engine optimization for ecommerce site like Magento. Tips for SEO in Magento 2: The first tips is to keep the structure as simple as possible. For the most online shopping site, the page rank of your products depends highly on the homepage. The deeper the site structure is, the weaker the page authority gets. Secondly, try to keep the product page fewer than 3 clicks away from the homepage. This makes a clear way for the crawlers when indexing your site. For an ecommerce site, navigation is a must-have as it helps users to browse your site more easily. But, you’d better be careful with it as in many cases, the Googlebot could waste a ton of your crawl bandwidth crawling in and out of navigational filters. Tips for SEO in Magento 2: One smart solution for SEO-friendly navigation for Magento 2 is to use AJAX. Default Magento 2 has not supported this feature yet so you may consider trying extension to solve this problem. You won’t have to worry about the optimization of your ecommerce site if no one wants to click on the link that leads to it. Relevantly titled URLs tell Google what the page is about while giving visitors helpful information. Tips for SEO in Magento 2: Below is an ideal URL structure for search engine optimization to ecommerce. The most basic configuration to start search engine optimization in Magento 2 is to set up Google Search Console (aka Google Webmaster Tools) and Google Analytics. With Google Search Console, you can monitor and maintain your site’s presence in the search results, and how Google can crawl your site correctly. Meanwhile, Analytics is a practical tool to track data about traffic on your site. Both are free and easy to sign up. If you are using both www.domain.com and domain.com, then Google will take the www as a sub domain. But this makes it confusing when deciding which domain to be displayed and ranked. SEO tips in Magento 2: You can set up in the Google Search Console about which domain will be displayed in the SERPs. Redirecting is also necessary to transfer users to the main domain of your site. In general, https is a more secure version of HTTP. HTTPS works in conjunction with another protocol, Secure Sockets Layer (SSL), to transport data safely (which is the key difference that Google cares about). Hence, since 2014, Google has officially announced that they prefer the https than HTTP regarding ranking factor. SEO tips in Magento 2: If you are already using HTTP and considering moving to https, remember to track your migration carefully in Analytics and Webmaster Tools. You may need to set up some change in data tracking and crawling. The robots.txt file is placed in the root of your Magento 2 installation. This robots file will be read by the search engine crawlers as an instruction of how to index the site as your wishes. The Magento robots.txt, hence, plays an integral part in SEO. INDEX, FOLLOW Instructs web crawlers to index the site and to check back later for changes. NOINDEX, FOLLOW Instructs web crawlers to avoid indexing the site, but to check back later or changes. INDEX, NOFOLLOW Instructs web crawlers to index the site once, but do not check back later for changes. NOINDEX, NOFOLLOW Instructs web crawlers to avoid indexing the site and to not check back later for changes. Admins are also allowed to edit custom instruction of the robots.txt in Magento 2 backend. SEO tips in Magento 2: A good SEO tip is to exclude some private pages or pages with internal use from the indexing and following process of the bot. All cart and login related page should be hidden from the Google bots. The same goes with checkout and thank you page (when finishing the order). 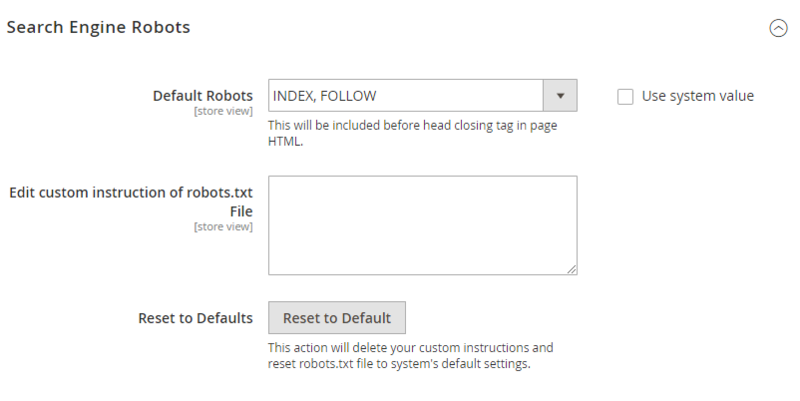 To set up this specific instruction for the robots tag, you can use the custom instruction feature or just simple installing module like Magento 2 SEO Extension for an easier configuration. If the robots file is an instruction, then a sitemap is a map showing the ways to all pages of your site to the crawlers. The XML sitemap in Magento 2 will be submitted to Google Search Console. Then, the search bot will follow all the provided links and index your site. What default Magento 2 supports: Under Stores => Configuration => Catalog => XML Sitemap at the backend, a basic XML sitemap is easy to generate. By default, the open options for XML sitemap include setting the frequency and priority for the update of product, category and CMS pages. You can read the tutorial of setting up XML sitemap by default Magento 2 for more details. Tips for XML sitemap in Magento 2: For a business with a large number of products, you should consider upgrading the default sitemap for a better crawling from search bot. Dividing sitemap and exclude some private links from the XML file are highly recommended. Some online business owners underestimate the importance of HTML sitemap and refer to it as unnecessary. However, the HTML sitemap is also read by the crawlers. Missing the HTML sitemap in your Magento 2 store means that you miss the second chance to be indexed more carefully by Google. At the same time, the HTML sitemap is truly helpful for users when searching on the site. What default Magento 2 supports: Unlike in Magento 1, the default Magento 2 currently does not support auto-generate HTML sitemap. SEO tips in Magento 2: To generate a detailed HTML sitemap for Magento 2 you may consider using third-party extension such as Magento 2 HTML Sitemap. Rich Snippets is a term used to describe a type of structured data markup that you can add to the current HTML of your Magento 2 site. This structured helps search engines understanding the site’s content and enabling special features when showing your store in the search result pages. What default Magento 2 supports: For the default Magento 2 store, only rating and review of product pages are enabled to be visible in the SERPs. SEO tips for Rich Snippets in Magento 2: Rich Snippets enables admins to provide plenty of useful details about your product to increase the CTR. For example, the price of an item should be added next to review and to rate on the search result. 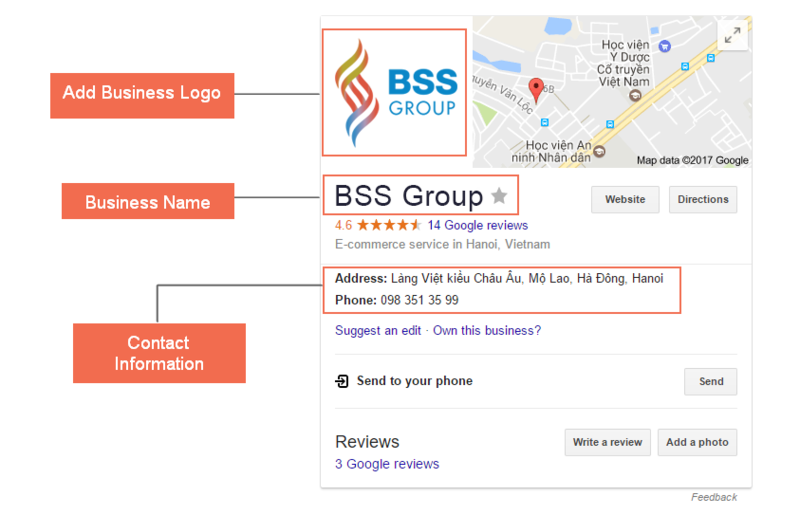 Business information such as store name, logo, contact, address, social links is another markup to gain brand trustworthiness. 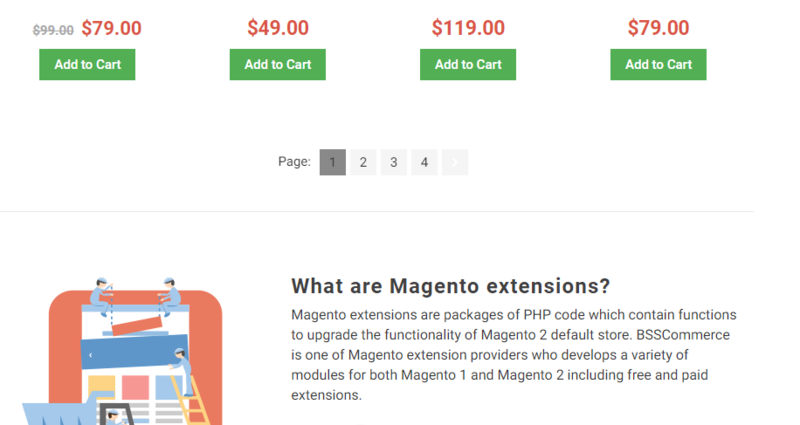 These markups can be configured to enhance the default Magento 2 rich snippets by installing the extension. Generally, when a user shares a web page link on social networks, the URL will appear in the text form only. 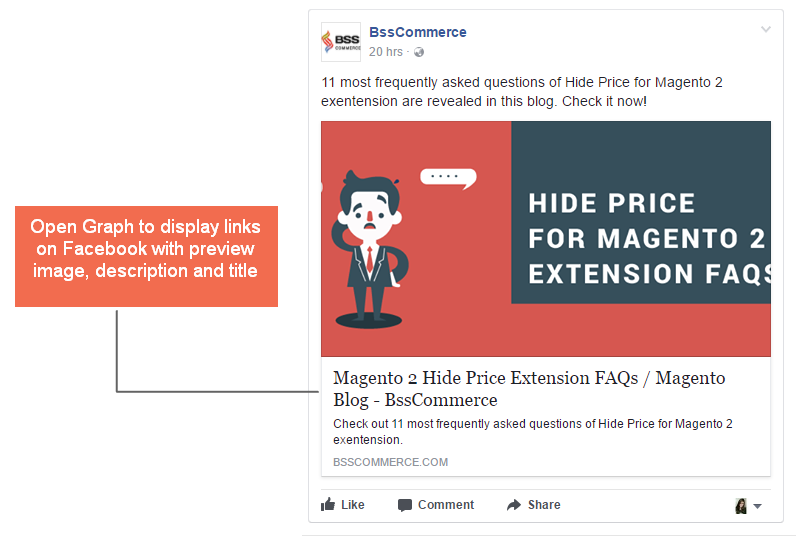 If your Magento 2 store supports Open Graph (for Facebook) and Twitter Cards (for Twitter) tags, a preview of title, description, and images will be displayed along with the URL. What default Magento 2 supports: Both of the tags is currently not integrated into the default Magento 2. SEO tips in Magento 2: You can implement the tags on your site with the help from a developer. The tags are pretty easy to set up. If you can not hide one, there are many extension in the market for this feature. Too many URLs with similar or the same content gains you bad reputation from crawlers. For example, the same shirt with different variation (e.g., red color, blue color) will have the same product content but different URLs. For multi-store view Magento 2 site, you might have the same content in English on different URLs aimed at the UK, the US, and Australia. The difference on these pages might be as small as a change in prices and currency. Google might not understand on its own what you’re trying to do and see it as duplicate content. SEO tips in Magento 2: Hreflang tag is developed to solve this issue. With this code, you specify all the different URLs on your site(s) that have the same content. These URLs can have the same content in a different language, or the same language but targeted at a different region. The social share button allows a customer to share their favorite items on social platforms such as Facebook, Twitter, Google+, Pinterest, etc. This sharing gain a lot of chances to raise traffic and visibility for your business. SEO tips in Magento 2: Equipping your site with the social share is not so difficult to do. You can get support from a developer or install a free module from Magento marketplace. The main purpose of search engine optimization is to get your ranking as high as possible for relevant keywords searched by your visitors. The keyword research, hence, is a key success factor. Google keyword planner is a practical tool for this process. SEMRush and Ahrefs are also two popular platforms. With this tool, not just finding the right keyword, you should look into your competitor activities and ranking. What are their primary keywords? What is their highest ranking keyword? Which keywords do they use for the hot selling products? SEO tips in Magento 2: Review the difficulty, generally lower-volume are easier to rank for than higher – aim for a single keyword/topic per page – always have a primary keyword to target for each page. SEO tips in Magento 2: You can consider excluding the category and sub-category. This makes your URLs shorter and more keyword dense. Your meta title is the first and the most critical impression the visitor has for your pages. It has a huge impact on the click-through rate. Don’t forget to include the main keyword of the pages in the meta title as it is a must. The ideal length for meta title is 50-60 characters. Using actionable words such as “discover now,” “shop now” increases the urge to click for visitors. The meta description is the perfect choice to provide customers with additional information for your products to gain more click from the search result. 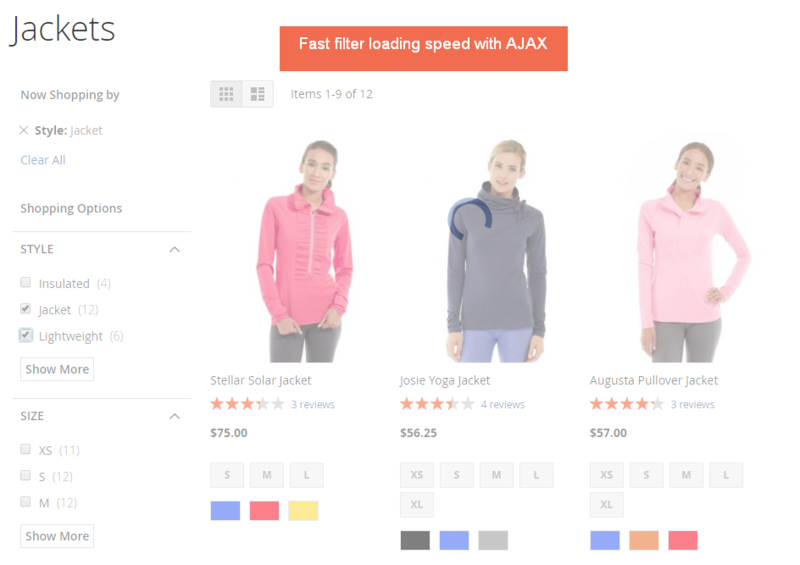 Tips for meta description in Magento 2: With thousands of products under management, store owners often find it challenging to generate meta description for all of their items. However, the extension like Magento 2 Meta Tags Template can help you create meta info in bulk. The template allows you to use variables such as category name, product attribute to differentiate the description. There are two types of breadcrumbs. Breadcrumbs in the search result will show the navigation path of the product, which make a better display. The other is breadcrumbs of the product, category right at its page. SEO tips for breadcrumbs in Magento 2: For an ecommerce site with a complicated structure and lots of sub-categories, breadcrumbs is a useful solution to navigate user better. Some retailers take it lightly when it comes to the content of your products. This leads to a considerable SEO mistake as crawlers will judge your product as a poor-content page. As a result, lower in ranking is predictable. Write long and detailed content as much as possible. Not just for the crawlers but also for the user. Set the H1, H2 and H3 tag for the description. Include the main keywords in the heading. The main keywords can be found in the first and the last 150 words. Keyword density of the main keyword should be over 3% but not higher than 5%. You can check this with SEOQuake extension. Contain internal link. Try to contain the link to related products which have a high ranking and traffic in the description. User-generated content gains more content and trustworthiness for the pages, especially for a product with little information. The rating can also be used to display in rich snippets. Recommendation for SEO in Magento 2: Q&A section is highly recommended. It allows the user to interact more with your site and increase the time on page, lower the bounce rate. Yes, you read it correctly. Category Page also needs content just like any product page. Adding more text to your categories helps to increase the keyword density for your category and raise the ranking power of the pages. Recommendation for SEO in Magento 2: Planning to add content for the category page needs a careful preparation for design. Don’t force the user to read too much. Place the writing in a suitable position. Here is an example of how we do it on our site. Recommendation for SEO in Magento 2: Don’t forget to fill the alt tag for all images with a keyword. It tells the crawlers what the image is about and makes your product show up in the image search. Secondly, optimize the image size to be under 100kB. This will speed up the loading time. Google prefers the rich-media content. If you have enough resources, try putting a video on your products page. It’s also the best way to help your product to be shown in the video search. In the video description on Youtube, remember to put the link back to your product page. Recommendation for SEO in Magento 2: Focus on your key products, put efforts on high quality and informative video. When publishing the video on your site, it’s better if embed. For an ecommerce platform like Magento, Search Engine Optimization requires various specific changes and settings. The 27 SEO tips for Magento 2 above such as sitemap, hreflang tags, speed loading and more are the remarkable optimization to be made. Leave a comment below if you have any question for our SEO experts! approximately this subject for a while and yours is the best I’ve came upon till now. I can agree with you more! Hope that our 27 Magento 2 SEO Tips are helpful enough to optimize your site for better ranking and performance!